Union Pacific's DD40X heading a consist of UP passenger coaches on an excursion over Marias Pass passes over the Glacier Park trestle bridge. UP had the 30 metre-long DD40X (2 SD40s on one chassis) made to commerate its centenary. This page has a collection of hints that are aimed to alleviate any concerns you may have when Train Sim throws up an error message - the majority of these errors are easily solved. Bear in mind that, after the splash screen, Train Sim is working hard when you see the "Loading..." message come up. What it's doing is checking through all the consist files to match the locos, freight wagons and passenger cars listed in each with the locos, wagons and cars that are each stored in their own subfolder under the \...\Trainset\ folder. Firstly, however, a couple of points about driving a train and signals. Train Sim's help and Engineer's Handbook have more about these topics but here are a couple of simple ideas. You'll see that diesel-electric locos have a throttle that works in notches - idle, notch 1, notch 2 through to notch 8. This means we need to take a different way of looking at how we drive a train than a car or electric loco which have continuous accelerators or throttles. So your diesel loco may be rolling down a grade at idle or pulling up a steep grade on notch 8 at 30 kmh - in the latter case, that's as fast as you can go (unless, of course, you change your consist by adding another loco!). Train signals aren't simple "stop" and "go" signals like street traffic lights. You've probably observed a suburban train going past a light that has a red and wonder what's going on. Usually there'll be a second light under this one - "red over red" will indicate a stop but a "red over green" is telling the driver what speed to travel at in the next track section before he gets to the next signal. The dispatcher or controller (the computer in the case of Train Sim) has the task of ensuring only one train occupies one section or block at a time - the means of doing this is to signal the drivers on what speed to travel at in their section or block of track to give a train in front the time to leave the block it's currently occupying. For more about the intricacies of signalling, see the MSTS Tech Documents (on disk 1 of your installation CDs) or search the File Library at Train-Sim.com. Acela Express 0003 waits at Washington Platform 1. Rule 1: install one activity at a time and check if Train Sim still runs without any missing ENG or WAG files. Assuming you've downloaded and installed the tsunpacker fix and checked for any extra rolling stock needed by the activity, extract the packaged activity to your unziptemp folder. Close all programs, such as WinZip, word processor, and so on. From the Start menu, choose Run... and browse to your unziptemp folder - you'll have to choose All file types to see the packaged activity you want to install. Choose it and click OK.
A packaged activity normally contains the activity itself and any consists the author is using for the driveable train and computer-controlled trains. If asked to overwrite any files, say No. If you're not sure the activity only uses default locos and rolling stock, start up ConBuilder to check. From the Program menu, choose Program | Activities, choose the activity you want to check and ConBuilder will go through all the consists which a particular activity uses. 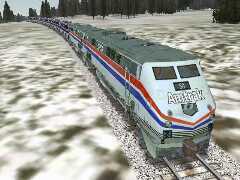 Amtrak AMD103 continues on its special excursion for MSTS fans across Marias Pass. Luckily the Superliner coaches are comfortable. You'll know if you've got a rogue loco or wagon (passenger or freight) in a consist when Train Sim informs you with a terse error message: "Error:continue? Missing ...". This rarely happens if you use ConBuilder and have replaced any missing locos or wagons with something you've got. One simple solution is to move the consist or consists from the Consists folder. Start Windows Explorer, open the consists folder, and order the files by most recent date. Choose the consist file you think has been installed today and move it to some temporary folder; restart Train Sim and see if you've got rid of the problem. Repeat this step if need be. To repeat, using ConBuilder will solve missing ENG or WAG files - you can test all your consists if you want. Just take one step at a time to find the rogue consist. Dash 9 meets Dash 9 on a snowy, winters day on Marias Pass. You'll know if your loco hasn't a cabview - either Train Sim will tell you it couldn't find one when you choose a particular loco to drive, or you'll have a strange view of the track ahead! If you're new to installing locos, go back to read the author's "readme" for the installation instructions and check you've followed them. Most often the instructions involve making a new folder under ...\Trains\Trainset\ (unless the author has a path set in the zip file). The next instruction is to copy another loco's cabview and sounds sub-folders to your new loco's folder so use Windows Explorer to check these subfolders are under your new loco's folder. Union Pacific SD90MAC's work hard to haul a special heavy freight up the grade at Essex on the Marias Pass. Aliasing is a method devised particularly by Chuck Schneider of NALW to eliminate the need to continually copy the same cabview and sound folders to new installed locos of same or similar type. This meant, for example, that the BNSF Dash 9's cabview and sounds could be used with any other Dash 9 design - a Dash 9 in Union Pacific livery or Dash 9 in CSX livery. It follows there's a great saving of disk space. As well, designers could take some graphics parts from different locos' cabviews and use them to build a new cabview for their own loco. There's nothing mysterious about aliasing. All it involves is editng a loco's cabview and sound files in WordPad so insert the full path to any particular graphic or wave file you want to use with your new design. You've already seen above the path to sounds and cabviews in the Common.Snd and Common.Cab sub-folders (an indea by Chuck Schneider of North American Locomotive Works). There are some examples of aliasing on the menu on the right. It's a simple and effective method, however - just plain old editing of files. New Haven EP5 heads the Merchant Limited. 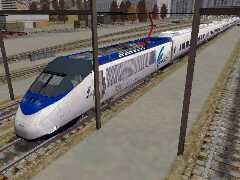 The Activity Editor is a tool that's installed as part of a normal Train Sim installation. Other parts of the MS tools ar the Route Editor tool and the Consist tool. If you're going to use these tools, copy the Tech Docs off CD1, ensure you download the latest version of the tools from the MS Train Sim site, and refer to all the advice that's gone before you in the Message Areas at Train-Sim.com. A problem with the MS tools is you need a monitor of resolution 1024x768 or better. That's one reason for webWiz recommending ComBuilder so you can still create and edit consists. At this stage, webWiz has only a 800x600 monitor so he's unable to say more. But, as you've guessed by now, he's a big supporter and user of ConBuilder.